Official volleyball rules for competitive players and coaches. It is a fault for players to make contact with the net while in the action of playing the ball. 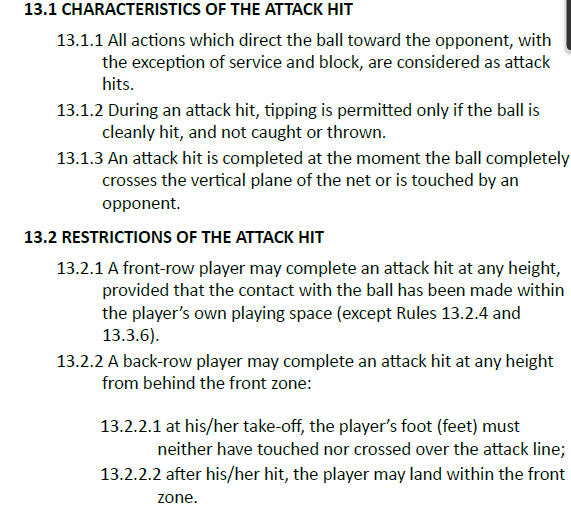 The ball driven into the net causing a net isn't a violation. And the player doesn't have to actually touch the ball to be at fault. 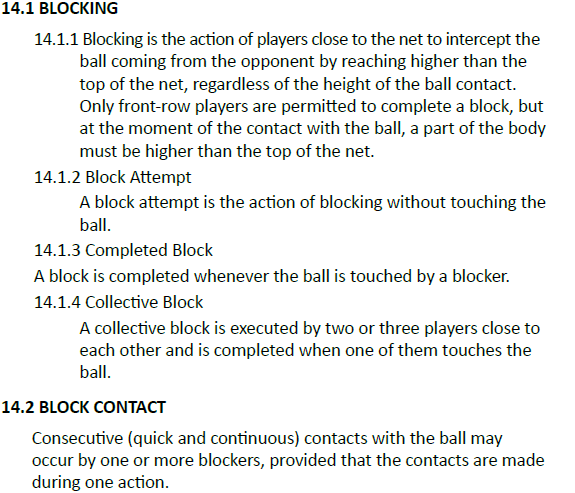 For example, if a player reaches higher than the top of the net in an attempt to block, this would be a net violation if the blocker makes contact with the net. A player can't touch the ball in the opponent's space before the opponent has a chance to make contact. It's not a fault if the ball breaks the vertical plane... if the ball is in the plane, either side can make a play on the ball. 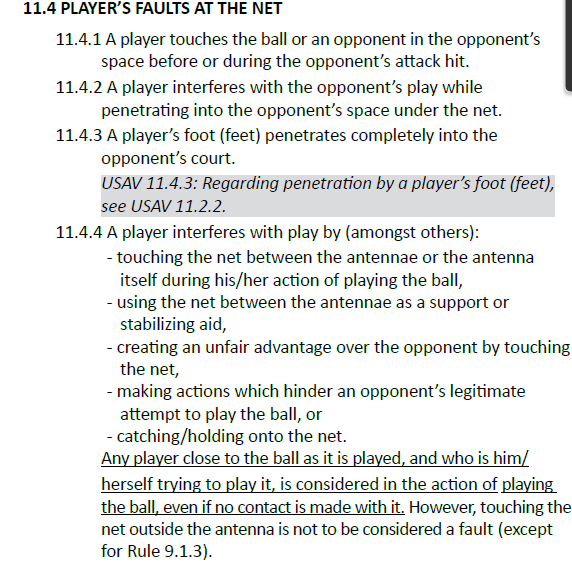 However, if the entire ball is on the opponents side of the net, and the opponent is there to make a play, then if you reach over the net to make a play on the ball, it is a fault. Also, it's legal to reach over if the ball is coming over anyway. When attacking the ball (sending the ball over the net to the opponent), the ball must be cleanly contacted (ball can't be caught or thrown). The exception would be when blocking. A block isn't an attack. The block is a deflection of the ball coming from the opponent. 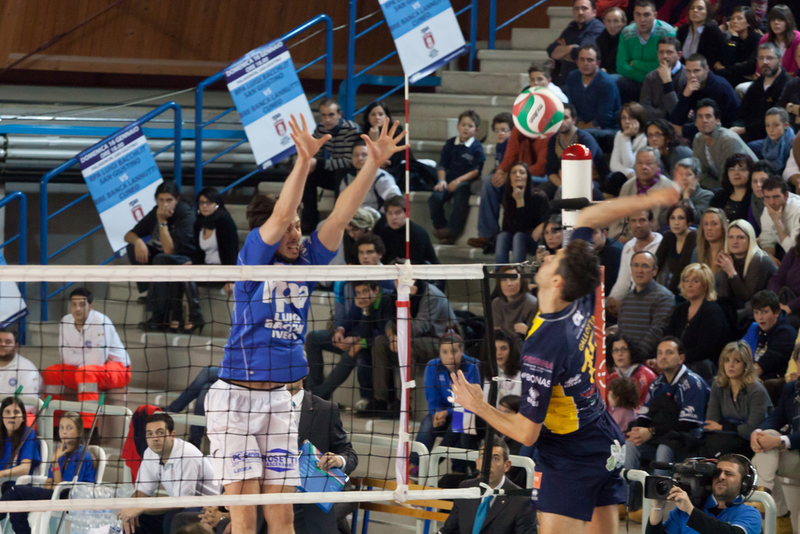 Attack hits may be completed at any height as long as the hit happens on your own side of the net. Back row players aren't allowed to attack from in the front zone (and while the ball is entirely above the top of the net). The defensive specialist that is only allowed to play on the back row is called the libero. The libero where's a different jersey from the rest of the players on the net. 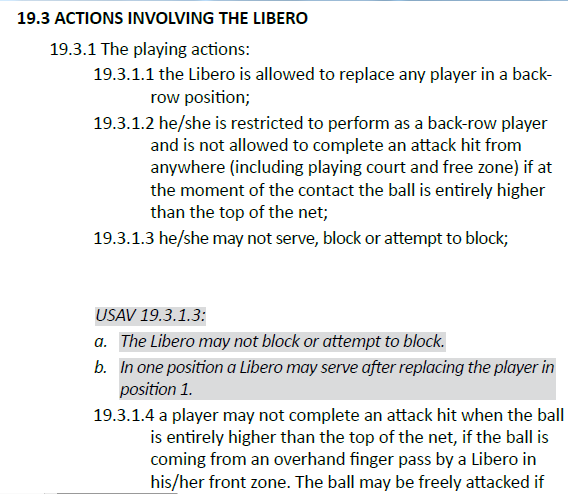 The libero has special rules. The libero can't complete an attack hit (contacting the ball while the ball is entirely above the top of the net and sending it over the net). The libero also can't hand set to a teammate from inside the 3-meter line (assuming the player that the libero sets the ball to completes an attack hit while the entire ball is above the top of the net). However, if the libero is positioned beyond the 3-meter line, the libero can hand set a ball to any attacker that then completes an attack hit with the ball above the net.